It is unusual for a band to peak 25 years into their career, yet this is exactly the story of Behemoth, whose crowning achievement thus far is unquestionably their 2014 opus “The Satanist”. 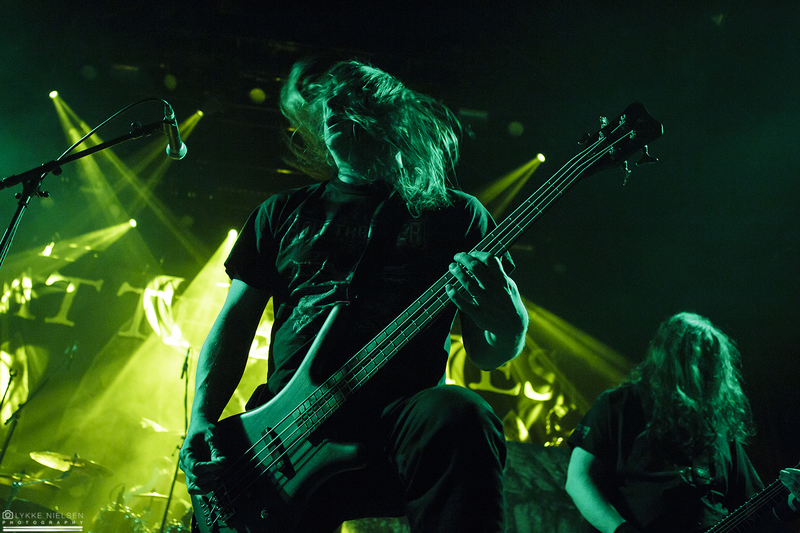 Since that album was released, the Polish maestros have achieved an unprecedented level of popularity as far as extreme metal goes, regularly maxing out venues like VEGA’s main hall and playing to tens of thousands of people in the most coveted slots at major festivals. 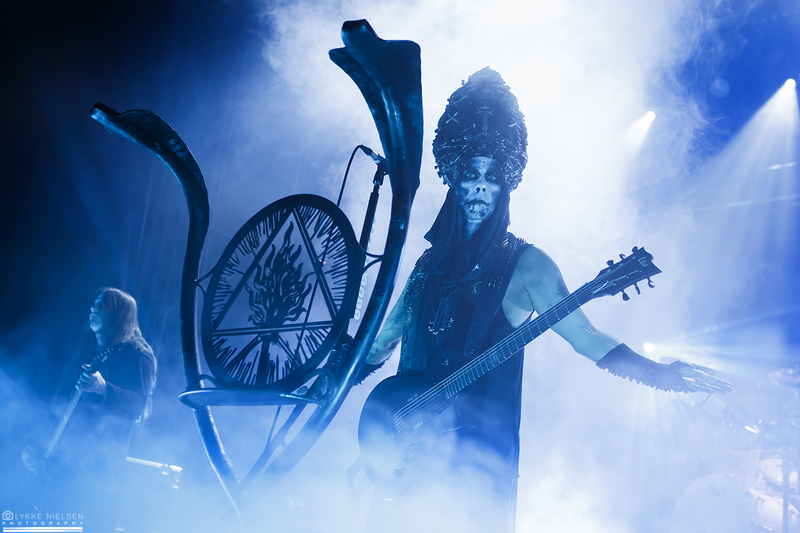 Their concert tonight was expectedly sold out far in advance as well, Copenhagen’s metal scene having turned up in force to gauge the potential of Behemoth’s latest offering, 2018’s “I Loved You at Your Darkest”, in the live setting ahead of their inevitable confirmation for one of the major festivals taking place in Denmark next summer. Unfortunately, a busy day means that I arrive at VEGA too late to see Wolves in the Throne Room open the proceedings, so for myself, this strong line-up kicks off with Gothenburg’s melodic death metal veterans At the Gates. Armed with a dense yet nicely balanced sound mix in which the powerful drums ensure that mouths stop moving and eyes turn toward the stage, At the Gates cut a strong figure as they kick things off with the title track to last year’s “To Drink from the Night Itself”. 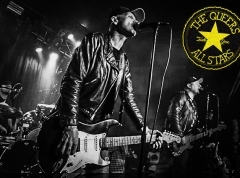 Stuffed into a WarPigs t-shirt and donning his signature cap, vocalist Tomas Lindberg is his usual informal self, taking every opportunity to enthuse about his love of Copenhagen, its beer and the reaction of the audience to tracks like “Slaughter of the Soul” (off its namesake legendary album from 1995), and taking a leading role in conveying the intensity of At the Gates’ music through his energetic showmanship. There is a lot more grit about the band’s performance tonight compared to Copenhell last year and it is also moodier thanks to the darker setting. Lindberg wields and waves his microphone stand like a flag bearer, commanding his troop of headbanging axemen through a balanced selection of material from the band’s three most recent albums bathed in classic dim shades of red, green and blue. Clearly, the group has a lot of belief in their post-reunion output, which, from an objective standpoint, is much more interesting than the four tracks aired off the aforementioned “Slaughter of the Soul” as far as ambition and composition goes. But while songs like “A Stare Bound in Stone” and “Death and the Labyrinth” (the latter taken from 2014’s comeback album, “At War with Reality”) impress, it is nonetheless the classic cuts such as “Suicide Nation” and “Blinded by Fear” that arouse the rowdiest responses from the audience, with their blunter, rawer style addressing the primate within all of us. With the notable exception of “Cold”, they may lack the instrumental grandeur of the set closer, “The Night Eternal”, but these are nonetheless the songs that get people into a festive mood and off their feet, not to mention inject an extra amount of badassery to Lindberg & his cohorts’ antics. 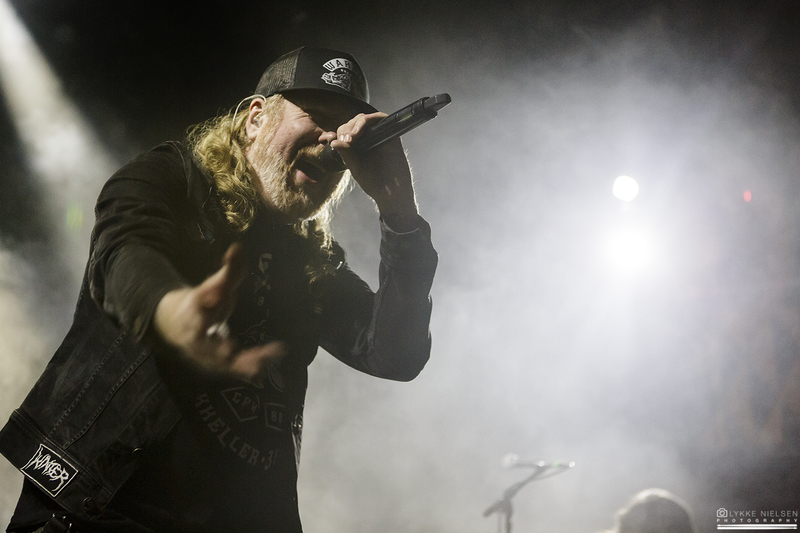 The magic of At the Gates’ return from their lengthy hiatus has long since withered away, but as this 12-track salvo proves, the Gothenburg legends still have plenty more to offer. It is a solid blast of old-school melodic death metal we are treated to here, albeit it could use a handful of truly chilling moments in order to make a lasting impression. The tailoring of the setlist for tonight is a textbook example of playing it safe by choosing the hits whilst totally shunning deep cuts from the band’s three first records that might have added a few more nuances to what is admittedly musically a pretty uniform, and at times even slightly flat experience. I will thus continue to look forward to that elusive headlining concert the band hasn’t played in Copenhagen since 1995 (!) for a more thorough walkthrough of At the Gates’ seminal repertoire. During the switchover, the usual soundtrack has been replaced by an eerie ambient hum interrupted here and there by brief samples of children exclaiming their distaste for God and Jesus Christ — sampled from “Solve”, which opens “I Loved You at Your Darkest”. It is the perfect way to set the atmosphere for the satanic mass that follows in spectacular fashion. 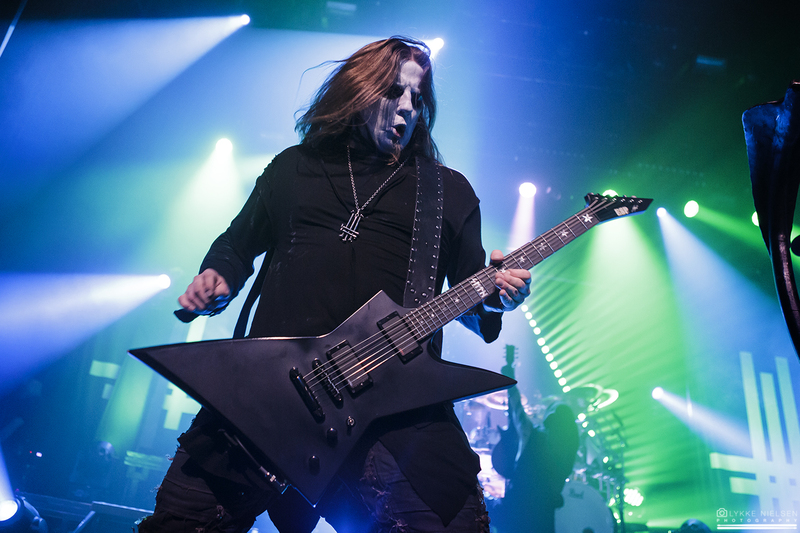 A reverted cross on a map of Denmark suddenly appears on the veil separating the stage from the audience, before a ghostly display of gargantuan silhouettes takes over, announcing the arrival of Behemoth. 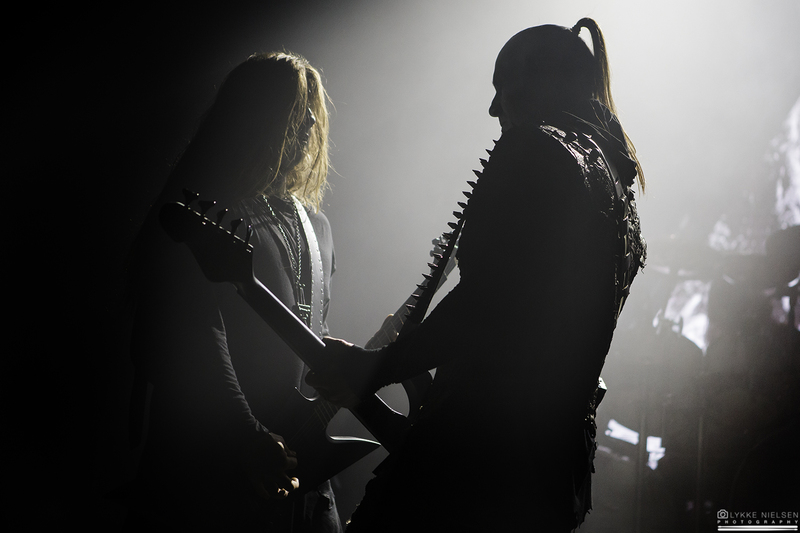 The curtain falls upon the onset of “Wolves of Siberia”, revealing a theatrical stage production centered on frontman Adam ‘Nergal’ Darski’s signature altar and a triangular, LED-lined screen at the back. If there was any doubt left in anyone’s mind that Behemoth have their eyes set on mainstream infamy, this setup will have convinced them at once, and likewise the showmanship of the four musicians (the band is bolstered by an additional guitarist, Patryk ‘Seth’ Sztyber, in the live setting) is unlike anything you will ever have witnessed in the extreme metal genre before. As “Daimonos” (taken from 2009’s “Evangelion) gets underway, Nergal & his cohorts surge toward the audience with their arms raised, pumping their fists and headbanging with such a vengeance it seems as though they’re still trying to win the Danish crowd over. The Polish maestros need not worry though — everyone in the venue looks completely mesmerised by the unholy majesty of their performance, and when the modern classic “Ora Pro Nobis Lucifer” (off 2014’s “The Satanist”) erupts from the amplifiers, the maxed out venue transforms into a witch kettle of circle pits, moshing and people surfing the crowd in euphoria, all the while thunderous roars of “For thine is the kingdom!” tear at the walls. Other black metal bands may have more street cred than Behemoth and be more extreme in their views, but none of them sound as evangelical in their preaching of blasphemy. Indeed the likes of “Bartzabel” witness satanism pushed into biblical proportions as Nergal appears from backstage donning a black papal mitre for its monophonic, Gregorian chants, creating an impression of a band desecrating a Catholic church, before “Ov Fire and the Void” conjures hell itself amidst fountains of sparks and plumes of smoke and diabolical swathes of red light. Behemoth have the audience in their palm, which is no surprise given the level of musicianship they are exhibiting. The likes of “God = Dog” and “Conquer All” (the latter taken from 2004’s “Demigod”) prove these four musicians are operating at the apex of their abilities, with especially Zbigniew ‘Inferno’ Promiński cutting a stunning figure behind his drumkit no matter how chaotic or dissonant the music gets. Once that latter track checks out and the moshpit settles down, the crowd is left chanting “Be-he-moth! Be-he-moth! Be-he-moth!” in thrall of their antiheroes, and the four musicians respond with a frenzied rendition of “Blow Your Trumpets Gabriel” (the title of which is one of my favourites of all time given that it captures the spirit of Behemoth so perfectly). The Polish blackened death metal machine seems unstoppable now, with “Slaves Shall Serve” producing the most uncompromisingly extreme moments of the concert (in musical terms) and “Chant for Eschaton 2000” (taken from 1999’s iconic “Satanica”) proving an expected favourite with the most faithful elements of the band’s Danish fanbase. Unfortunately, the ensuing encore takes some of that steam away, offering up the slow and eerie atmospheric piece “Lucifer”, for which bassist Tomasz Wróblewski has chosen an bizarre feathery headpiece which looks like a dead peacock, as well as “We Are the Next 1000 Years” off the latest record. Far from standing out on the album itself, its selection as the final piece seems only to be motivated by its smooth segue into the instrumental “Coagvla”, at the end of which all four musicians return to the stage one more time to bang on marching drums for what is admittedly a pretty cool finale — but if I’m honest, I would have preferred for these to close out the ordinary set, leaving space for a truly savaging finale in which the likes of “Antichristian Phenomenon” and “The Satanist” from their namesake albums could have delivered the final blow to knock us all off our feet. Still, there is no escaping the fact that Behemoth have played possibly their best concert in Denmark yet, one which leaves me drooling at the prospect of experiencing a midnight mass with them at some festival next summer.